There has been a long history of interaction between mathematics and physiology. 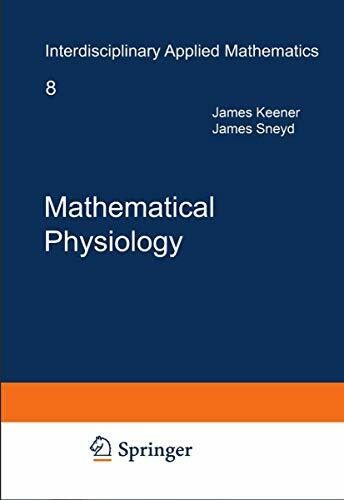 This book looks in detail at a wide selection of mathematical models in physiology, showing how physiological problems can be formulated and studied mathematically, and how such models give rise to interesting and challenging mathematical questions. With its coverage of many recent models it gives an overview of the field, while many older models are also discussed, to put the modern work in context. In this second edition the coverage of basic principles has been expanded to include such topics as stochastic differential equations, Markov models and Gibbs free energy, and the selection of models has also been expanded to include some of the basic models of fluid transport, respiration/perfusion, blood diseases, molecular motors, smooth muscle, neuroendrocine cells, the baroreceptor loop, turboglomerular oscillations, blood clotting and the retina. Owing to this extensive coverage, the seond edition is published in two volumes. This first volume deals with the fundamental principles of cell physiology and the second with the physiology of systems. The book includes detailed illustrations and numerous excercises with selected solutions. The emphasis throughout is on the applications; because of this interdisciplinary approach, this book will be of interest to students and researchers, not only in mathematics, but also in bioengineering, physics, chemistry, biology, statistics and medicine. The first edition was the winner of the prize for The Best Mathematics book of 1998 from the American Association of Publishers. 5. Mathematical Physiology. 2 vols. 6. Mathematical Physiology. 2 vols. 10. Mathematical Physiology. 2 vols.